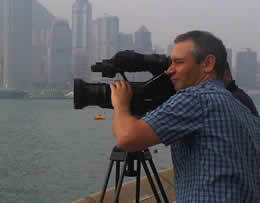 Greenscreen Cameras is the company name of lighting cameraman Chris Gurney. Chris started his career as a computer graphics designer, but swiftly moved into broadcast journalism, becoming one of the youngest ever news editors in Independent Local Radio. His career soon took him into television as a reporter and presenter, before he discovered his talent behind the camera. He’s now a successful freelance cameraman with more than ten years experience and an RTS Craft Camera nomination under his belt.